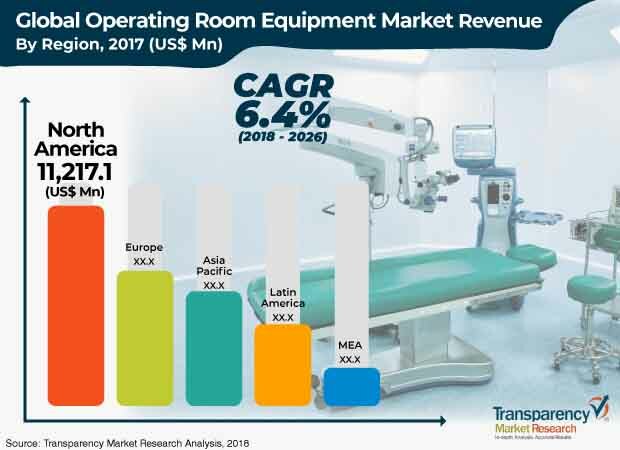 Transparency Market Research (TMR) has published a new report titled ‘Operating room equipment Market - Global Industry Analysis, Size, Share, Growth, Trends, and Forecast, 2018–2026.’ According to the report, the global operating room equipment market was valued at US$ 29,912.3 Mn in 2017. It is projected to expand at a CAGR of 6.4% from 2018 to 2026. Aging population and longer life-expectancy, increased awareness, and acceptance of advanced devices are likely to drive the operating room equipment market from 2018 to 2026. An operating room, also known as operation theatre, is a facility within a hospital or nursing home where surgical procedures are performed in order to treat different physiological conditions in a sterile environment. Technological advancements have brought a lot of change in the way surgical procedures are carried out. An operating room encompasses equipment such as movable imaging systems, biomedical systems, endoscopes, anesthesia systems, operating tables, operating room lights, surgical imaging displays, operating room integration systems, surgical booms, and microscopes. Significant advantages associated with operating room equipment and financial incentives by governments of various countries are major factors driving the operating room equipment market globally. Benefits of proper operating room equipment encompasses accurate and up-to-date patient handling, enhanced patient safety, and time and long-term cost savings. These advantages encourage health care providers to equip themselves with technically advanced operating room equipment, which in turn drive the market. In terms of product type, the patient monitoring equipment segment accounted for a dominant share of the market in 2017. Advancements in patient monitoring systems include heart monitors, breath monitors, body temperature monitors, hematology monitors, multi-sign monitors, fetal and maternal monitors, oximeter, and brain monitors. The movable imaging displays sub-segment led the patient monitoring systems segment of the operating room equipment market in 2017, due to availability of competitively priced mobile C-arms, increasing government initiatives to modernize hospitals, and increased number of surgeries. These factors are expected to drive the segment during the forecast period. North America held a major share of the global market, in terms of revenue, and is expected to maintain its position during the forecast period. North America is home to several key market players, such as Stryker Corporation, Hill-Rom Holdings, Inc., Smiths Medical, and SKYTRON who have their headquarters in the U.S., where they generate significant sales. Hence, North America is a leading market for operating room equipment, globally. High awareness about latest health care technologies and higher purchasing power are anticipated to boost the operating room equipment market in North America. The operating room equipment market in Asia Pacific is expected to expand at a rapid pace, primarily due to improving health care infrastructure, growing demand for state-of-the-art hybrid operating rooms, and increasing adoption of biomedical systems across hospitals and clinics, rising disposable income, and technological advancements in countries such as China and India. The report also provides profiles of other major players operating in the global operating room equipment market. Major players include SKYTRON, STERIS plc., Dragerwerk AG & Co. KGaA, GE Healthcare, Koninklijke Philips N.V., Smiths Medical, Mizuho OSI, and STORZ MEDICAL AG.